Its really hard to write in days like this. The reality that we live in here in Israel is really absurd. This blog has never been a political one, and will not be one, but to ignore the current situation is impossible. I hope for peace and quiet for all. After getting that off my chest, I can now introduce you to the best pasta salad you’ve never had! Actually some of you may have had it because since I made the first time over a month ago, I’ve made it at least 6 times, and every time I get the same reaction: “This is the best pasta salad I’ve ever had”. It started off just before the Israeli holiday of Shavuot, when I was invited to a friends house for a potluck meal. 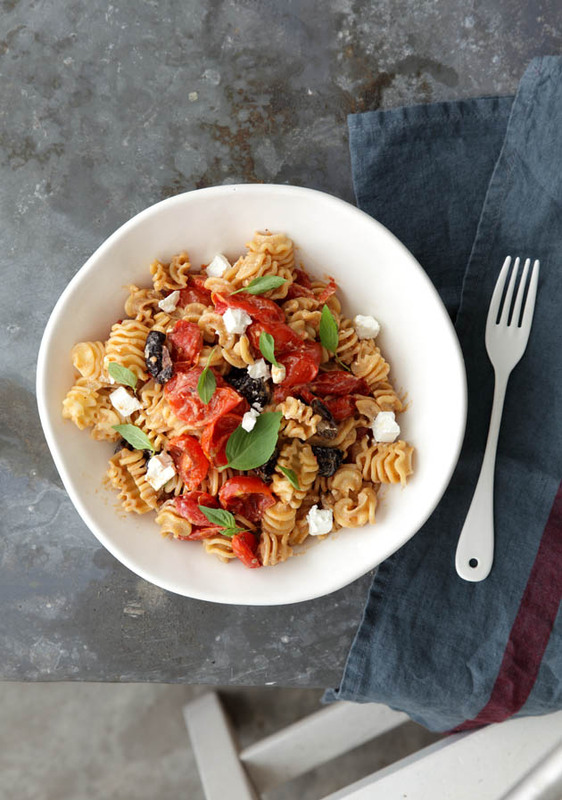 I was given the task of bringing pasta salad, and during one of my several phone calls to Danya that week I asked if she had any interesting suggestions to jazz up the typical Greek cherry tomato/red pepper/olive and feta pasta salad. She threw out the suggestion of oven-roasting the tomatoes and adding balsamic vinegar. I’m a cook who likes to stick to a written recipe, but this time I went with the flow and just went with my gut. I oven roasted the sweetest cherry tomatoes I could find with some sea salt, added them (and their juice to the pasta), added a bit of balsamic, some really good feta, some black olives, and there it was. The first “trick” of this pasta is the oven-roasted tomatoes- the juices released while roasted-sweet tomatoes mixed with olive oil and salt, makes for the most perfect pasta sauce. 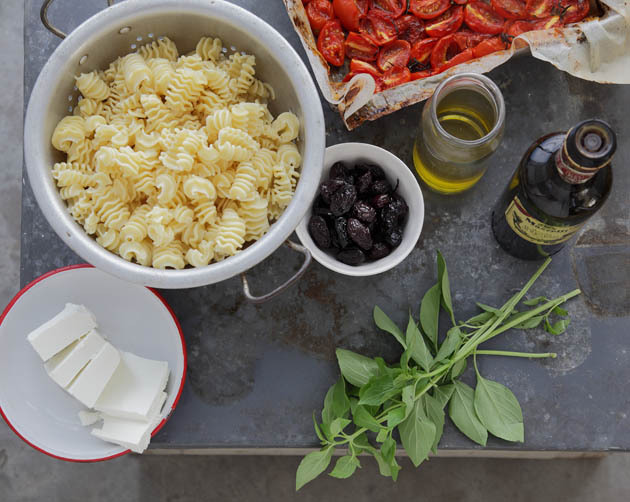 The second trick with this pasta is to use the best quality ingredients you can find- cherry tomatoes, pasta, balsamic and olives. That little bit of extra effort (and money) will go a long way with this recipe. Preheat oven to 400F/200C. Line a baking dish with parchment paper. 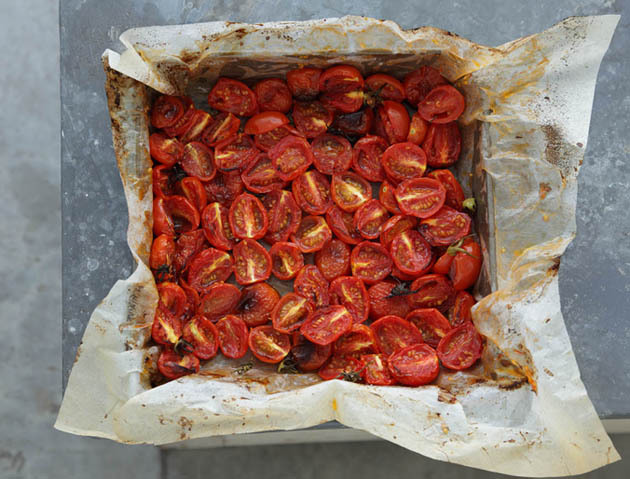 Place the cherry tomatoes on the baking dish and top with sea salt and olive oil. Bake for 30-40 minutes, until browed and very soft. Make pasta: cook pasta al dente according to instructions. Drain and top with olive oil and balsamic vinegar and mix to combine. Add the roasted tomatoes (including all the juice from the baking pan), and mix to combine. Add the black olives, feta cheese and basil. Season with salt and pepper. Cover and refrigerate until cold. Serve cold. Lovely salad! I will definitely try it! Sending love and prayers for peace from your readers in the USA. This looks so delicious! And I agree that it is hard to write in days like these. May there be peace soon. I am also thinking about your beautiful country and sending prayers for peace from the United States. Great web site with a bunch of useful content! I love it! I have ripe cherry tomatos in the garden and 3 refugee families in the house- this might be a good idea for dinner for all of us today! Thanks and stay safe. web page regularly, if so afterward you will absolutely take good know-how. I pray for peace for both sides of conflict.